My first memory of the Himalayas was from my fifth grade Social Studies textbook where there was a small photo of Mount Everest with a brief caption stating that the westerner who had scaled it attributed his success to the Sherpa who had carried all his gear. Fast forward to 1996 and the ill-fated attempt by an American team to scale Everest. The news that four climbers had died, including the team's leader, was shocking. Afterward, I read Jon Krakauer's book Into Thin Air and I was stunned by his description of the circumstances and extreme conditions that led to such a tragic outcome. Later on, the Annapurna Range hit my radar when Jackie, a Weight Watchers member, presented me with a book about the first female expedition to reach the Annapurna summit. It was a fascinating story and I hoped that perhaps someday I'd have a chance to see these mountains myself. This past week we arrived in Kathmandu with all the mystery that name evokes. I explained to Shyam (Sam), our guide, that this was it for me. I needed to see these mountains now. Nepal is a young person's game and I wouldn't get another chance. He politely cautioned me that the mountains often don't reveal themselves, hiding in the clouds and disappointing even the most patient sightseers. Later that day, he suggested that we'd better avail ourselves of every opportunity to get up close - and this meant getting on a tiny turboprop and flying above the clouds for a birds-eye view of this magnificent mountain! My heart skipped a beat - I was terrified at the thought - but after only a moment's hesitation I enthusiastically agreed! 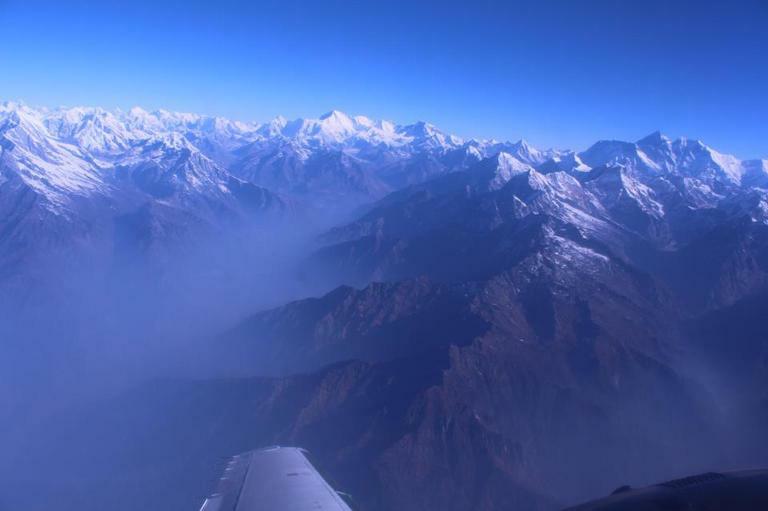 So at 5 AM I met up with a handful of other thrill-seekers at the local air terminal, and soon I soared up into the sky headed for the Himalayas. Would I really see it? The crew assured me that if I didn't, I would not have to pay. But (I thought) when would I ever get another chance? I stared out the small window willing the mountain to appear, while Katie and Brandon sat across from me doing the same. "Mom! Mom!" Katie suddenly exclaimed! OMG - there it was, straight in front of her - the entire mountain range! Moments later the flight attendant bustled down the aisle and began pointing out the different peaks by name. Then without warning she ordered me to go up to the cockpit, and to join the captain for a better view! It took my breath away. The mountains were stunning as the sun reflected off the dazzling snow-capped range right in front of me! As I sat there trying to permanently etch this amazing vista into my memory, the pilot pointed toward a triangle-shaped peak and said "That's Everest". My eyes filled with tears. Was it the grandeur? Perhaps. But more than that it was that fifth grade girl who had just realized her long ago dream. I had come so far.